Attack Pandi Graduates to Guns? Yes folks, it's time once again to turn our attention to the continuing adventures of Attack Pandi. You might recall previous episodes here and here. Shortly after the attack, the DMK rewarded its young warrior with the post of Chairman of the Madurai District Agricultural Marketing Committee. Seriously. And the only reason I know this is because while he held this post, he was charged with abduction, robbery, and attempt-to-murder - and granted bail. Awesome, right? But wait, there's more! During trial, video clips on the newspaper office attack and statements of witnesses, including the newspaper’s senior employees and journalists, were recorded. However, the witnesses turned hostile (The Hindu). The Central Crime Branch (CCB) police recovered Rs.1.35 crore from the possession of accused and suspects, including Rs.75 lakh in cash from the residence of a Dravida Munnetra Kazhagam functionary V.P. 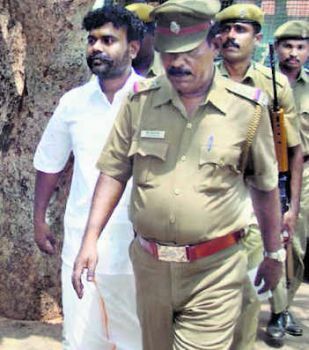 Pandi alias ‘Attack’ Pandi, in connection with the Jeyam Reals and Games case here (The Hindu). After putting a whole lot of work into Attack Pandi's Madurai trial, someone at the Central level was apparently livid that the whole thing ended up a farce. It appears that the DMK's love affair with Pandi is drawing to a close as well - last month the police apprehended a parcel containing two guns and ammunition, which they say was intended for Attack Pandi. I guess that means he's out on bail again? Doesn't this blog post strike you as a little Madurai-centric?? Tamil Nadu-centric, perhaps, but I don't understand - is that wrong? Well, the bloggers at Sepia Mutiny keep asking us to have a "South Asian perspective" when commenting. Usually, this means dropping local/national identities. Oh, like that. I don't think they've ever asked anyone to drop local/national identities, but rather not to privilege them. I don't envy the Sepia Mutiny bloggers their task of managing comments. They get a lot of them, and a lot of those are totally inane. The idea behind their South Asian perspective is one of inclusiveness, and from what I've read (it's been a few years since I followed SM closely) targets comments which are India RaRa - Pakistan and occasionally Bangladesh BooBoo. I respect this, even if I've disagreed with how it's been implemented at times. Anyway, the reason I didn't explain anything in this blog post is mainly because I'm lazy and because I provided some background in previous posts about him. I've found it worth following from time to time over the past couple of years because 1) the guy's name is ATTACK PANDI and 2) because I'm sure there are many Attack Pandis out there throughout the world and it's a strong example of Goonda Rule and nepotism. I will police you!!!!!! you must include references to west bengal in all posts!!!!!! (more seriously, your points below are very good, and after many years of idiotically sniping at sepia mutiny, i have to say i fully agree with you :) it's a good thing there are people like you around! Ok fine. I saw Sitaram Yechury speak at Columbia last week. His responses to repeated questions about Singur, Nandigram, industrialization, and neoliberalism were along the lines of either "Everyone else is doing it" or "It's the opposition's fault." no you have to make references to all of west bengal! gorkhaland, darjeeling, siliguri, howrah, calcutta, digha, mednipur, etc. otherwise you are biased and will go to identity purgatory! the comment thingy doesn't seem to be working right. i can't reply to ttcusm's comment. anyway: "Well, the bloggers at Sepia Mutiny keep asking us to have a "South Asian perspective" when commenting." that's funny because it's so american, i belatedly realize. South Asia is all about regional/local perspectives - it's hard to make sense of what little I know of South Asia without them.